HELENA, Ark.-- In "Life on the Mississippi," Mark Twain recalled this town as "one of the prettiest situations on the Mississippi." Located on the river's west bank at the base of a long ridge 65 miles south of Memphis, the town took root and grew prosperous during the mid-18th century as a center of river commerce and cotton. Handsome red brick storefronts were erected along its Cherry and Walnut streets, and warehouses and wharves along the riverbank bustled with activity. Despite religious conservatism, Helena also buzzed with the rowdy entertainments of a riverboat town. But the town's fortunes waned, starting with a Civil War battle there in 1863 and exacerbated by periodic flooding and the long decline of the steamboat era. Although railroads eventually came to serve the region, the main lines and new factories favored higher, less flood-prone lands west of the ridge. Pinned between the ridge and the river, Helena had no room to grow. In 1909 the new town of West Helena was incorporated over the ridge, and the old streets downtown continued their decline. 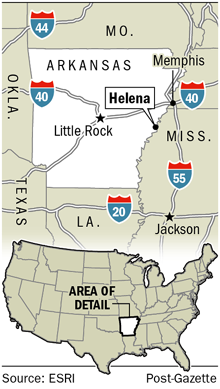 So for the past 70 years, Helena's primary fame has been about the blues. In the early 1940s, a Helena blues fan persuaded the owner of radio station KFFA-AM to let him have a 30-minute program each weekday afternoon at 12:15, a slot timed to coincide with the lunch break on local farms and factories. Hosted since 1952 by "Sunshine" Sonny Payne, the "King Biscuit Time" program has featured thousands of live interviews and performances with blues players attracted to local juke joints, including now legendary names such as guitarists Houston Stackhouse, Robert Nighthawk, Willie Wilkins and Dudlow Taylor. That daily radio exposure is credited with helping to spread the Delta Blues upriver to Memphis and Chicago and eventually around the world, earning Helena the reputation as the "Buckle of the Blues Belt." 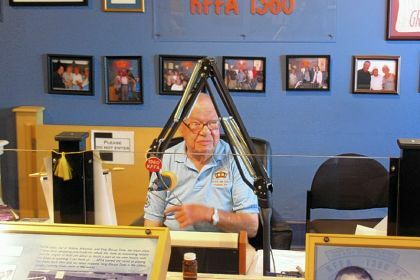 "King Biscuit Time" still airs each weekday at 12:15 p.m. on KFFA, making it the world's longest running blues radio program with more than 16,750 shows. These days, daily programs are also streamed live over the Internet. In 1986 to capitalize on that heritage and liven up the flagging town, local enthusiasts organized the first King Biscuit Blues Festival, a one-day event featuring local performers playing from the back of a flatbed truck. That humble beginning gave rise three years later to the creation of the Delta Cultural Center, a small museum in a derelict feed shop on Cherry Street in downtown Helena that chronicles the evolution of the music, its players and their instruments and also now serves as the studio for Mr. Payne's daily "King Biscuit Time" broadcasts. 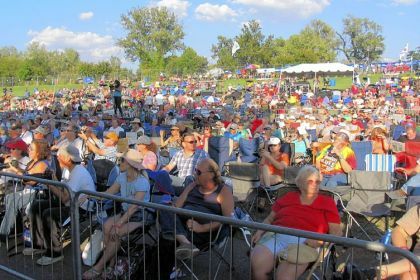 The festival has grown into an annual three-day event that attracts hundreds of musicians and thousands of blues lovers from around the world each October. For musicians, many willing to come perform for honorariums, King Biscuit can be a rite of passage, a rejuvenation good for reputation and roots, a chance to reconnect with old friends and commune with a knowledgeable, appreciative audience. For blues lovers, King Biscuit is a musical feast. The flatbed truck has become The Main Stage, a permanent pavilion built on Cherry Street facing the grassy slope of the levee. People set up their lawn chairs and spend the days enjoying performances and socializing between sets. Other temporary stages set up on Helena streets host free performances on Friday and Saturday. Add several other small clubs and street performers, and Cherry Street's six blocks become pretty much solid music from end to end. 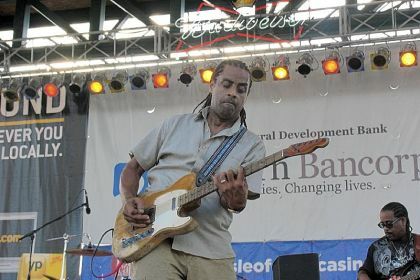 In addition, there's a Saturday Blues symposium; crafts vendors hawk blues-related items and instruments; and food trucks dish out Delta delights, from hush puppies to fried alligator. During my visit last fall, I enjoyed hearing headliners such as Cyril Neville, Bobby Rush, Taj Mahal, Kenny Neal, Roy Rogers (the guitarist), James Cotton and Bonnie Raitt. Not an especially knowledgeable listener, I got my first taste of the dynamic duo of Tyrannosaurus Chicken, the electric guitar blues of Fruteland Jackson, the soulful sax of Phillip Stackhouse, salty harmonica of Big George Brock and the driving riffs of Eddy "the Chief" Clearwater. Starting at 11 each morning, the blues fill the atmosphere of Helena with a heady musk of hot licks and seductive soul. With all the activity focused around the Cultural Center, it was no problem to look around in the breaks between sets. So in addition being enjoyable, the festival was, for me, educational. On Thursday at noon, I stopped into the Cultural Center, where, with a dozen other music lovers -- including several from Britain, Japan and South Africa -- I watched "Sunshine" Sonny Payne do his half-hour show. A free blues symposium was offered Saturday in the old Malco Theater, where writer Don Wilcock moderated a panel of musicians discussing the origins of the genre. It was interesting to hear musicians speak candidly to an audience of maybe 100 about their life and craft, and then, hours later, hear them perform. The Cultural Center Annex in the newly restored rail depot was also worth a visit. Its first-floor exhibit covers two centuries of Helena history, and on the second floor, a day-by-day chronicle of the bloody Civil War battle and its consequences adds perspective. Getting acquainted with all that back story certainly helped me better appreciate the context from which the music emerged. That made for a richer, more rewarding listening experience. For anyone who relishes the blues, making the pilgrimage to Helena for King Biscuit will be like coming home. King Biscuit Blues Festival in Helena, Ark. This year's 28th King Biscuit Blues Festival runs from Oct. 10-12 and features more than 60 acts. The Main Stage headliners include the Gregg Allman Band, Bobby Rush, Robert Cray, James Cotton and Marcia Ball. A three-day pass to The Main Stage enclosure costs $40 in advance or $45 at the door, and various sponsorship packages that also access to the VIP area in front of the stage and Saturday night party in an adjacent tent start at $200. All the rest of Helena's music is free. For those so inclined, there's camping and RV parking along the river. 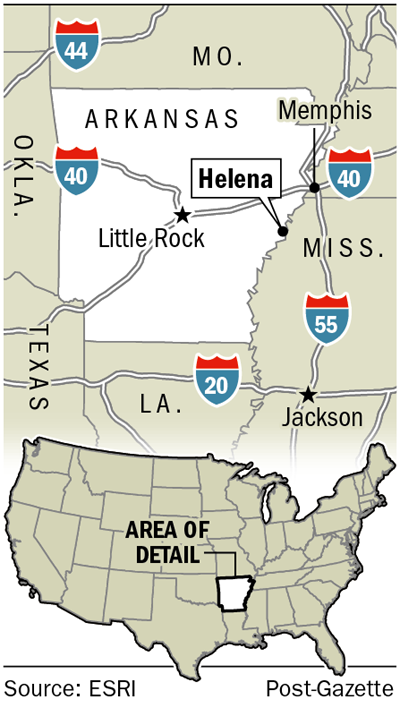 Helena features several small inns and hotels, with more motels in West Helena. Two casinos across the river in Mississippi offer more extensive accommodations. • The King Biscuit Blues Festival, www.kingbiscuitfestival.com. • Arkansas Delta Music Trail, http://deltabyways.com. • "King Biscuit Time" on KFFA, www.kffa.com. • The Delta Cultural Center, www.deltaculturalcenter.com.